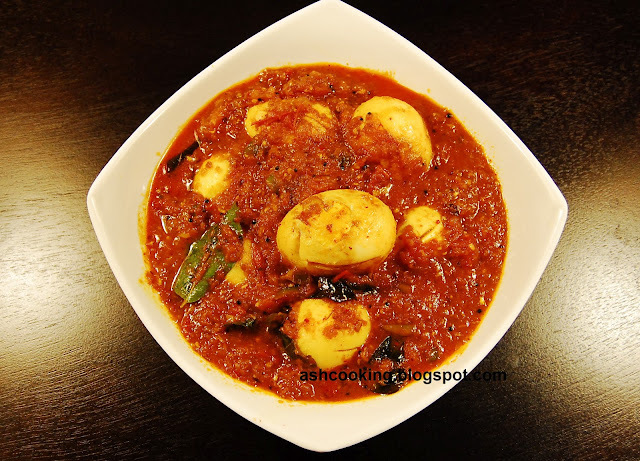 Egg Pulusu is an archetypal Andhra cuisine with tamarind pulp and an assortment of exquisite Indian spices cooked together. I adapted the recipe from Sanjeev Kapoor. Though I have kept the ingredients more or less similar to what he has used, but I slightly twisted the preparation according to my taste bud. 1) Heat 1 tbsp of oil in a frying pan. When oil turns smoking hot, add fenugreek seeds, cumin seeds and coriander seeds. Allow them to sizzle. Add the onion and fry till golden brown in color. Then grind them together into fine paste. Set aside. 2) Heat oil in a wok. Make few incisions on all around the eggs with the help of a knife. Toss the eggs in a pinch of turmeric powder and salt. 3) When oil comes to a smoking point. Slide in the eggs and fry them till golden brown in color. Take them off the flame and keep aside. 4) Into the same oil, now add the ingredients for sauté and wait for them to crackle. 5) Quickly add green chillies, tomatoes and ginger-garlic paste. Sauté for 5 minutes. 6) Add turmeric powder, kashmiri red mirch and the masala paste made above. Sauté till oil leaves the sides. 7) Add tamarind extract, salt and required amount of water for gravy. The gravy will be thick in consistency, so avert adding too much water. Cook for 2 minutes. 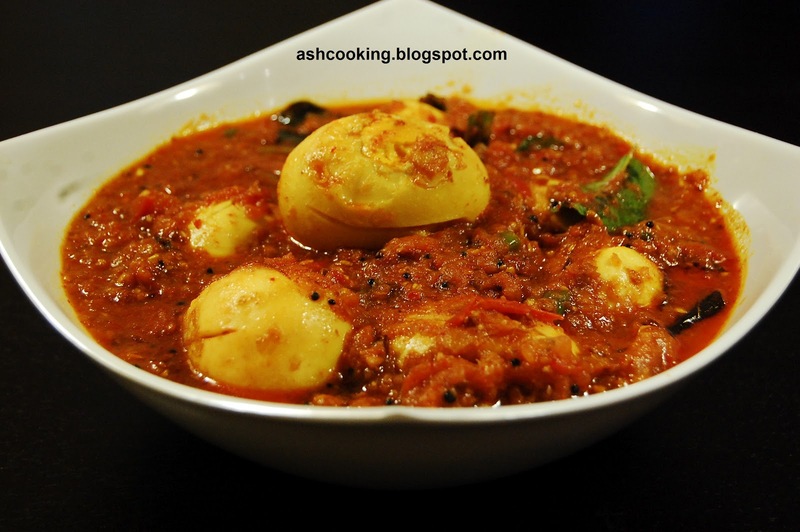 8) Slide in the eggs and cook covered for couple of minutes to let the spices combine into a robust flavour. 9) Serve hot with rice or pulao.